Madrid, Spain - The Global Peace Tour 2009 arrived in Madrid for an evening of interreligious dialogue, entertainment, and discussion of ways to strengthen the family and promote an attitude of service to society. The event took place in a downtown hotel of Madrid, Hotel Tryp Atocha, and was attended by 200 people representing all walks of life. Most of the guests were long-time friends of our UPF activities, giving the event a kind of family reunion spirit. Sofia, Bulgaria - On the second day of the Orthodox Easter, Bulgaria welcomed the Global Peace Tour 2009. The event was hold at the Hotel Central in the very center of the city of Sofia. It was a good opportunity to organize on the same day a half-day conference for educating Ambassadors for Peace. The first session was on the topic "Good governance, good leadership." This issue is especially important for Bulgaria, since the quality of leaders has been a matter of serious discussions during the past two or three years in the country. Andorra La Vella, Andorra - About a hundred people from throughout Europe, Asia, and South America attended a Peace Tour gathering at the Crown Plaza Hotel in Andorra La Vella. The audience in this small country in the mountains between France and Spain included Christians, Buddhists, and Muslims. There were Catholic priests, NGO leaders, and members of an English-speaking association as well as representatives from the UPF community in nearby Barcelona, Spain. The UPF has created a portal page for the United Nations International Day of Families being held worldwide on May 15th. The UPF is planning several events around the world to commemorate this day. To find out more on the IDF come visit our page or the UN Official site. Free PDF of UPF Today. The newest issue of UPF Today has been released in Korean and Russian. 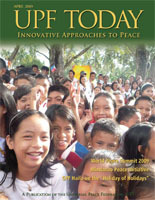 Get your copy of the May 2009 edition today! Beirut, Lebanon - Young people are the hope and future for each nation, and this is even more the case in countries like Lebanon that are seeking to move on from a generation of instability and violence in the region. With this in mind UPF Lebanon decided to make sure that the Beirut stop on the Global Peace Tour - part of the United Nations International Year of Reconciliation - included plenty of youth-oriented activities. United States - The Ambassadors for Peace Association of Virginia has launched a new task force: Global Orphan Outreach, Families for Children. The desire to help underprivileged children and orphans has been repeatedly expressed by Ambassadors for Peace, (AFPs) and many active AFPs are currently running projects which help orphans, or have done this type of work in the past. Geneva, Switzerland - When nine religious leaders, role-played by youth delegates representing their faiths, reported the results of their fact-finding missions to the Middle East and South Asia on "Prevention, Mediation and Peacebuilding" in a simulation of the "United Nations Interreligious Council", the full room of more than 250 government and UN representatives, religious leaders, experts and civil society leaders listened intently. Kenema, Sierra Leone - An International Leadership Conference and Global Peace Tour event was held in Kenema, a town at the center of recent violence and conflict. The Conference registered religious leaders, members of civil society groups, NGO's and members from the community anxious to hear new ways of reaching for reconciliation..
New York, United States - Despite the failure to reach a unified statement, the recently concluded Americas Summit in Trinidad and Tobago is certainly a step in the right direction. But there is much work to do. In March, UPF.ORG had visitors from 170 countries. The top ten is topped by the United States. Come visit our site and put your own county in the top ten! London, United Kingdom - Standing room only, in the House of Parliament's largest committee room, this conference, New Vision Amid the Economic Crisis, contrasted the moral and spiritual values promoted by civil society and faith based groups with the approach of the G20 Nations Summit held at the same time in another part of London. In the lead up to the G20 UPF had issued a Statement emphasising the need for ethical change. Rome, Italy - The Global Peace Tour event in Italy took place in a conference hall at the national parliament, with support and participation from a number of senators and deputies from the national assembly and local political leaders from Rome and other cities, some of whom who had travelled through the night in order to attend. Remarks at a Global Peace Tour 2009 session at the UNESCO headquarters in Paris, France, March 31, 2009. Humanity is indeed one family but remains a divided family. International institutions such as the United Nations and UNESCO stand in positions analogous to parents in a family. The task of parents is to nurture, support, educate, and, when necessary, maintain order. Dhaka, Bangladesh - Straight talk about the sacredness of human sexuality: "This is exactly what we should be telling our students," declared Dr. Eva Saadia Saad, Chairman, Department of World Religions, Dhaka University who chaired the one-day seminar on "Family is the Foundation for World Peace." Free PDF of UPF Today. 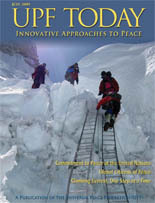 The newest issue of UPF Today has been released. Get your copy of the April 2009 edition today!